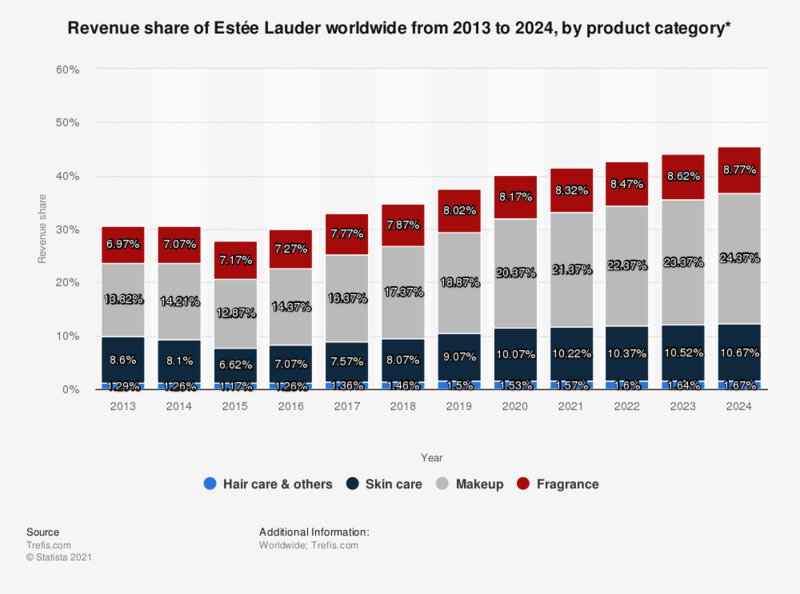 This statistic depicts the revenue share of Estée Lauder worldwide from 2013 to 2024, by product category. For 2017, it is forecasted that approximately 7.57 percent of the Estée Lauder Companies revenue will be generated by its skin care products category. Estée Lauder Companies is headquartered in Midtown Manhattan, New York City and was founded in 1946 by Joseph Lauder and his wife Estée Lauder. The company is a manufacturer and marketer of prestige skin care, makeup, fragrance and hair care products. Figures are estimates that have been calculated by the Trefis Team. Women: How important is that beauty brands offer products that make you happy?